Habitat : It is a deciduous, perennial herbs, and shrubs commonly found in india. Uses : This ayurvedic herb will leave your hair glossy, stronger, thicker, dandruff-free, and healthy. Cassia obovata gives you all the benefits of henna without color results on dark hair tones. For those with light shades of hair such as blond, strawberry blond or grey hairs the cassia will color your hair and give you the perfect uplift to your natural hair tone. Leaf powder is an excellent hair conditioner which makes hair glossy and thick, with a healthy scalp. When you mix this green leaf powder with warm water, it has a strong smell similar to a heap of warm mowed grass. It is used as neutral hair dye. Cassia has high levels of anthraquinones and crysophanic acid are very effective inhibitors of skin fungus, mite infestations, bacterial and microbial diseases. 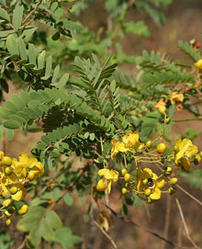 Cassia has been traditionally used to treat eczema, itching and skin infections in humans. It has also been demonstrated to completely cure bovine skin lesions due to Dermatophilus Congolensis, Pityriasis versicolor.